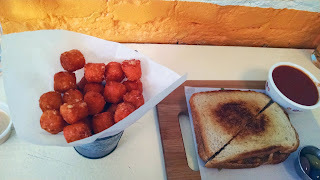 -Cheese Grille is a casual eatery with a modern twist on American classic: grilled cheese. -House-made spicy tomato soup ($5 for large, $1.75 for small) is so thick and compliments the crunchy and gooey sandwiches. It is great for dipping. -Both savory and sweet grilled cheese (Nutella, banana and Mascarpone with ice cream, anyone?) sandwiches are available. -I must urge you to get sweet potato tater tots (small $4, large $7). So crunchy and subtly sweet. -"Sloppy" ($8, Joe Cheddar, Groud Beef, Mascarpone, Pickled Jalapenos on Levain Pullman)--isn't that a perfect marriage of American classics? 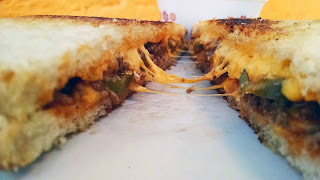 The mixture of Sloppy Joe and grilled cheese cannot go wrong. -Open late (3am on weekends) for your perfect late night munchies.